This month Heather of Randomosity and the Girl & Temperance of High of the Hog challenged us to make Chinese dumplings (I would normally call these potstickers but the challenge calls them dumplings). We had to use the Hot Water Dough recipe that was posted but were free to fill the dumplings with whatever we wanted. We could also pan fry or steam the dumplings. A few years back my friend Gabbi & I took a class in Chinese appetizers at Home Chef so I was pretty confident I could remember how to make these. We decided to go with a pork filling based on the one I had made in that class. Chop the cabbage coarsely in a food processor. Gather it in a clean dish towel & squeeze out as much liquid as possible. (You should end up with a little over 1 cup of cabbage). Combine everything together in a mixing bowl. I was a little worried the dough might be hard to work with but once it rested for an hour it was quite easy. The hardest thing was getting it thin enough, you want the edges of the circles to be thinner than the center. We thought we did ok but the edges were still a little thick once cooked. These dumpling were no where as thin as the pre-made wrappers you buy in the store. 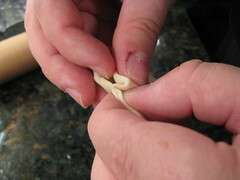 It took me a little while to get the hang of pleating the edges of the dumpling. I needed to lay them on the counter to do it. Matt on the other hand was a pro, he was able to fill & pleat the dumplings all in his hand like he had seen Anthony Bourdain do on TV. We pan-fried & then steamed the dumpling. This allows the filling to cook & gives you a nice crispy bottom. Heat 2 T of peanut oil in a non-stick skillet over medium-high heat. Arrange the dumplings in the skillet slightly touching each other. Fry until the bottoms are light brown, a minute or two. 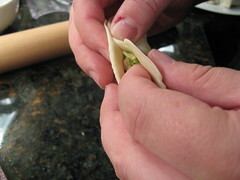 Add enough water to cover the dumplings halfway. Bring to a boil, then reduce heat to a simmer & cover. Cook until the water has been absorbed about 7 minutes. Remove the cover & finish cooking over high heat to evaporate any remaining liquid & crisp the bottoms. We served them with two different dipping sauces. The soy sauce & vinegar based sauce we were given in the challenge & then a mustard dipping sauce. The mustard went so well with the pork. Matt & I really enjoyed doing this challenge together. It made for a fun afternoon in the kitchen. I can see making our own dumplings again & mixing up the shapes & fillings. 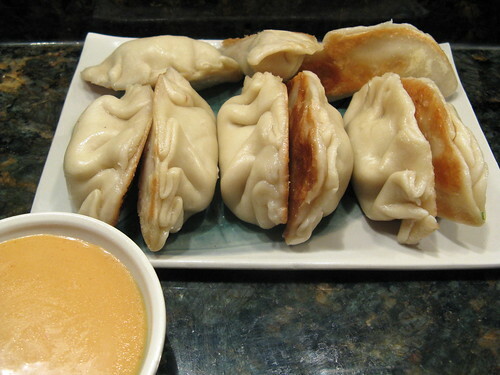 Visit Recipes to Rival to see what other people did with their dumplings. Kat- I love love pork dumplings. That is my usual and I was so tempted this time but I had to do something diff. I love how you used savoy. I paid almost five dollars for nappa for just a head. Yikes. And the savoy is one dollar at the market. Its so tender too. Great idea. Your dumplings look awesome and your technique worked great! Excellent! You should be proud! Those dumplings are gorgeous! Mine always come out awful and will not be showing them. Spastic dumpling girl that I am! Hmmm, now you've got me thinking - I wonder what the difference is between potstickers and dumplings?? Regardless, these look perfect and delicious! yours look so professional. it was such a great group cooking activity, wasn't it? your mustard sauce looks great, i didn't even think to make that. What a spread! My mouth is watering... maybe it's time for lunch. 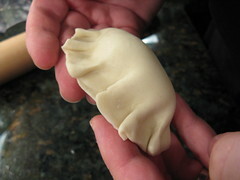 I love how you folded your dumplings and stole your method for making my "photographic" ones. My roommates and I have a quicker method when we're making 100 to freeze for future dinners. Your pleats are lovely, I am jealous of how well everyone did. and I love the golden brown bottom on them. Great job! great job! Your pleats look perfect! I'm glad you had fun making them! Wow, your dumplings look great. I'll have to try a pork filling next time! Great job! 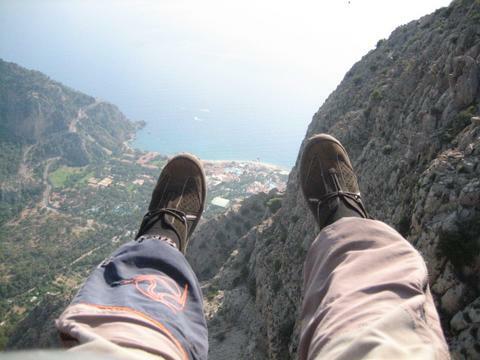 I wimped out on this one and passed it on to Giz. But, now I really want some dumplings! I like the pan frying. oh I love those chive pancakes too! 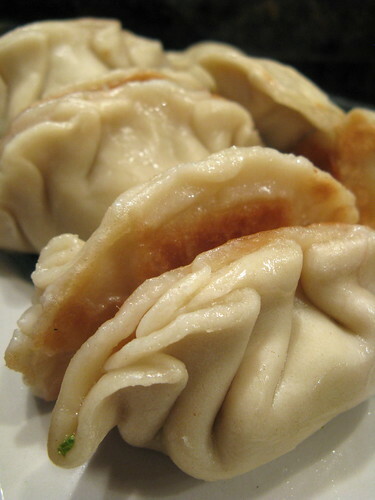 :) Your dumplings look perfectly pleated and beautiful. 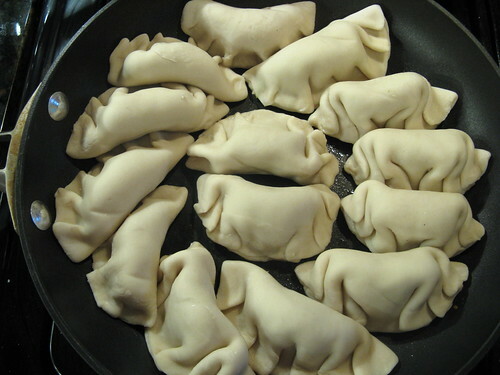 they look like cute little purses--i think i saw a few like that on the last red carpet (although i doubt those had pork or food of any kind inside...). :) the mustard sauce sounds yummy too. OMG, we are totally on the same wavelength lately! Your potstickers look awesome and I'm digging the mustard sauce. They are beautiful! I think your pleats look so professional! Yum. I want dim sum now. That's quite the spread..although I'd be sated from the dumplings, I'll risk upchucking and squeeze in a pancake or two! 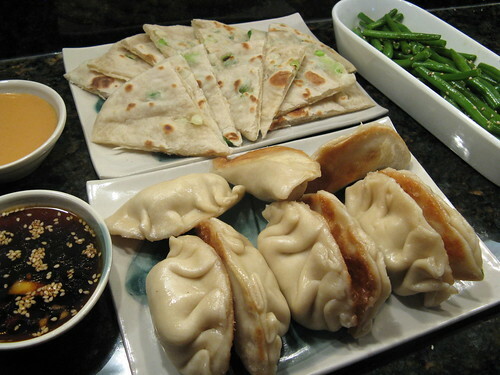 Your dumplings look awesome, and that meal with the beans and the scallion pancakes . . . I'm drooling! Your dumplings look amazing! I'm going to have to practice a lot more to get mine to look like that. Weren't these great! Your mustard dip sounds really good too. I'm jealous of your technique!